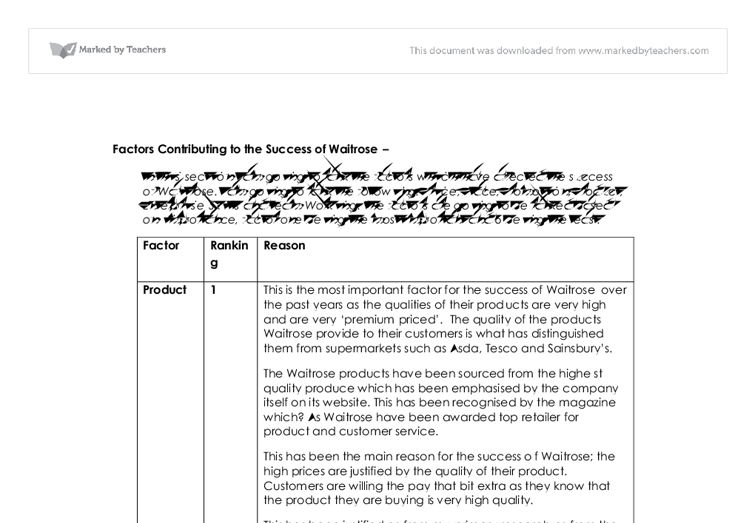 In this section I am going to rank the factors which have affected the success of Waitrose. I am going to rank the following: Price, Place, Promotion, Product, Enterprise Skills and Team Working. 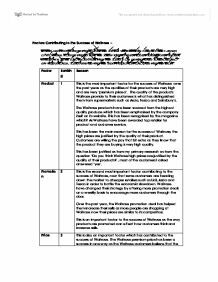 Factors Contributing to the Success of Waitrose - In this section I am going to rank the factors which have affected the success of Waitrose. I am going to rank the following: Price, Place, Promotion, Product, Enterprise Skills and Team Working. The factors are going to be ranked based on importance, factor one being the most important and 6 being the least. Factor Ranking Reason Product 1 This is the most important factor for the success of Waitrose over the past years as the qualities of their products are very high and are very 'premium priced'. The quality of the products Waitrose provide to their customers is what has distinguished them from supermarkets such as Asda, Tesco and Sainsbury's. The Waitrose products have been sourced from the highest quality produce which has been emphasised by the company itself on its website. ...read more. Over the past year, the Waitrose promotion deal has helped them increase their sells as more people are shopping at Waitrose now their prices are similar to its competitors. This is an important factor to the success of Waitrose as the way products are promoted can effect how customers think and increase sells. Price 3 This is also an important factor which has contributed to the success of Waitrose. The Waitrose premium price has been a success in one way as the Waitrose customers believe that the price of the products is justified by the quality the products. The price of the Waitrose products has had a massive contribution of the success of Waitrose but has also had a massive effect on the minor downturn of Waitrose as the credit crunch started to affect many customers; they are doing less shopping at Waitrose in order to save money. ...read more. The high level of enterprise skills at Waitrose has enabled them to understand the customers and partners needs from the business. And has helped them have the best customer service. And the best partner's development programme which makes the partners feel fulfilled at work. Team Working 6 This is another important factor which has contributed to the success of Waitrose. All the partners at Waitrose work together and there is good communication better the partners. This has an overall effect on Waitrose as it increases the quality of customer service, makes work more efficient and makes team bond together to give better input. the good team work is all down to the amount of work Waitrose put into improving meeting , social outings and parties which are organised to help the partners socialise more with each other but this does not work all the times as sometimes the partners just socialise with their main mates. ...read more. Specific projects and initiatives are also developed by Tesco Monaghan and have a local flavour, tailored to the needs of the Monaghan community. Tesco Monaghan support Healthy Living, Education, Community, Local Sourcing and the Environment. Tesco have told us that in recent years customers have showed an increasing interest in where the food comes from and how it is sourced. Paul told me that they have lost somewhere in the region of 8% of their customers. In order to counter this and try and regain customers Tesco Monaghan have slashed the price of 1000's of items. This type of waste disposal will also create a negative impact on the environment as it will be burnt and then the waste emissions will go into the atmosphere increasing global warming further. This means that Ginsters packaging is having a negative effect on the environment. This will help me to make sure that I meet these criteria when opening the bakery a making sure the business mission of "To make fabulous cakes for all occasions and to please our customers through quality and a smile :)"
Collect information: where are we now? 3.Make plans: how do we meet the objectives ? 4.Monitor progress: how successful are we? Why I need a business plan- A business plan is needed as it provides specific information about your company, it structures the businesses life cycle and shows all of your business associates (bankers, lenders, parteners). The store director, fresh food manager, non-food manager etc. need to have these personal skills to be a good higher level of staff in the industry. This indicates that the higher level of staffs needs to have the right personal skills in a higher sector such as responsibility, leadership, organised etc. and their business It is an opportunity for them because it will allow them in the future to access the biggest market in the world which means that they can sell their products to a single market containing 500 million people.